This is technically my first completed knit of 2016! I started it last August and finished the knitting part at the very beginning of November… but then I waited for two months and a half to weave in the ends and sew on the buttons, no idea why! 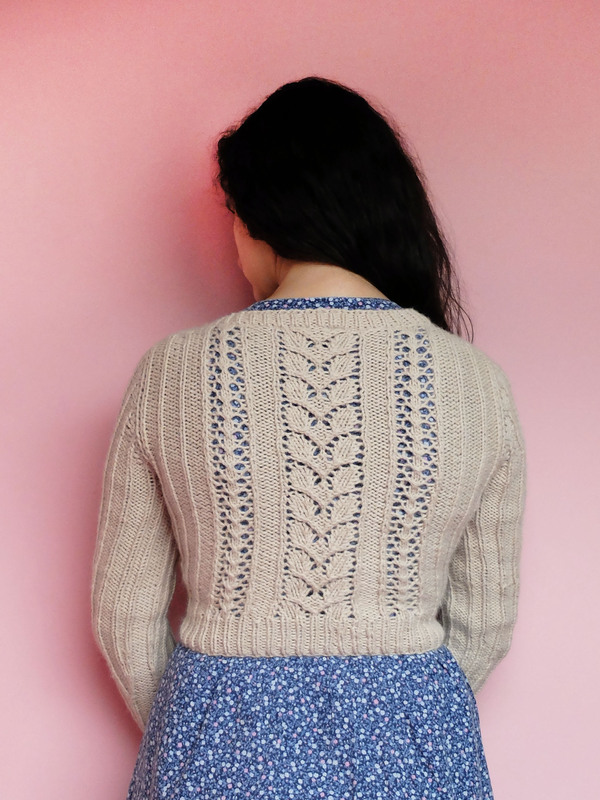 When I finally got to it, it was nice spending an hour or two on the finishing touches and getting the impression of having made a whole cardigan in so little time! This Agatha cardigan is my seventh Andi Satterlund sweater/cardigan, and my third time using Drops Nepal yarn (a wool and alpaca blend). What can I say, I’m a creature of habit! I have nothing new to say about the yarn, it’s still very pleasant to work with and to wear, and its only negatives would be that it sheds a little bit of hair on any dark clothes I wear with it, and that it has a strong smell when it’s wet. As for the pattern, it uses the same construction as all of Andi’s sweater patterns, but I would rate it as a little bit more difficult than the other ones I have knit. With the different lace panels of the body that don’t have the same number of rows in their respective repeats, it took me a long time to memorize the repeats and I constantly had to refer to the diagrams, save for at the very end. So nothing complicated per se, but it did require more concentration than the other ones I’ve made, and I am kind of in awe of the people who chose this pattern as their first sweater! 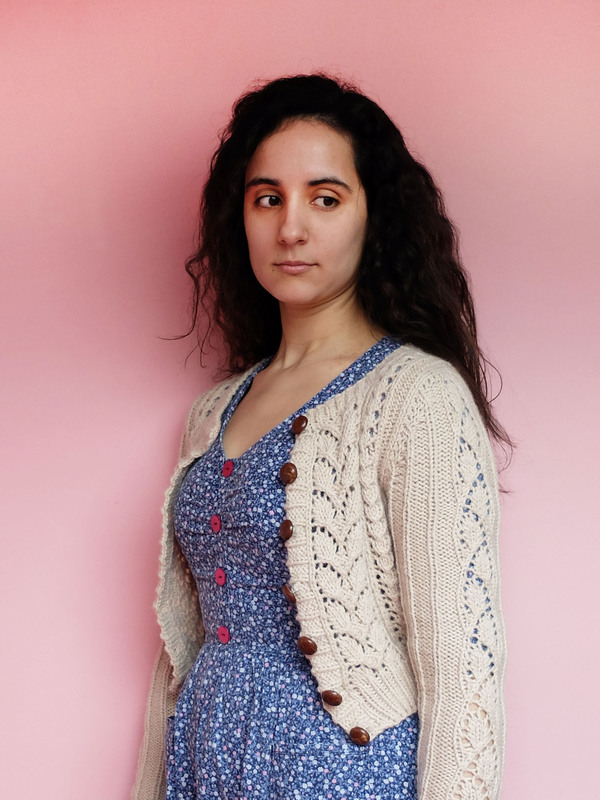 There are two little things I’m not in love with on the finished cardigan: the first one is the fact that the upper sleeves are a touch too wide for me, even though I made my usual size (Ravelry notes here). When I look back at the pictures of the pattern, I see that’s how they are supposed to fit, and it’s probably just that I’m used to a closer fit, so nothing serious there. The other small negative is entirely on my part: I don’t know how I managed that, but I messed up the top buttonhole, which ended up way too close to the edge of the button band! I realised that when sewing on the buttons, so I attached the top button accordingly at first, but then I realised I mostly (more like, always) wear my cardigans open, so it made more sense to sew the button on the same line as the other ones, and have it look crooked when the cardigan is closed (i.e. possibly never) rather than when it is open. Plus, I can also wear it with all buttons closed but the top one like I did in some of the pictures here. 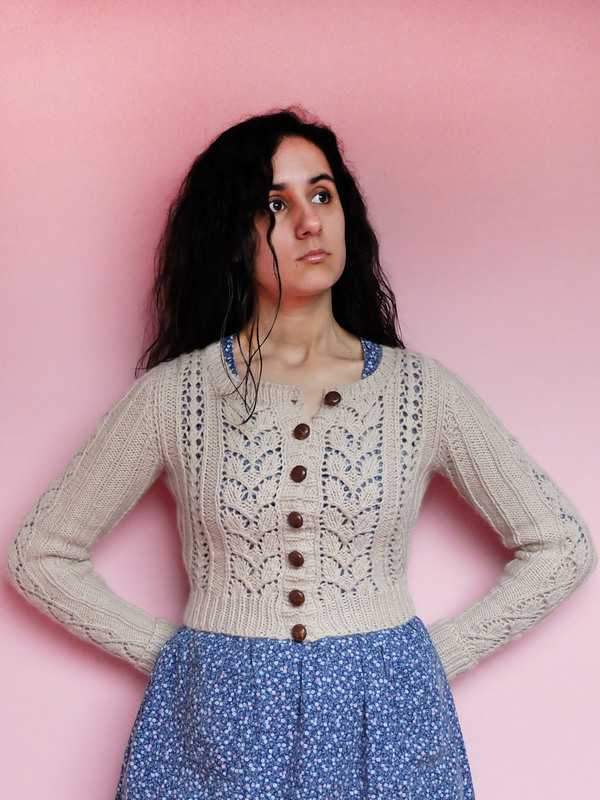 Come to think of it, the top buttonhole is on the part I knit last, so if it still bothers me after wearing the cardigan for a little while, I could always reknit it… Though I doubt it will be the case! 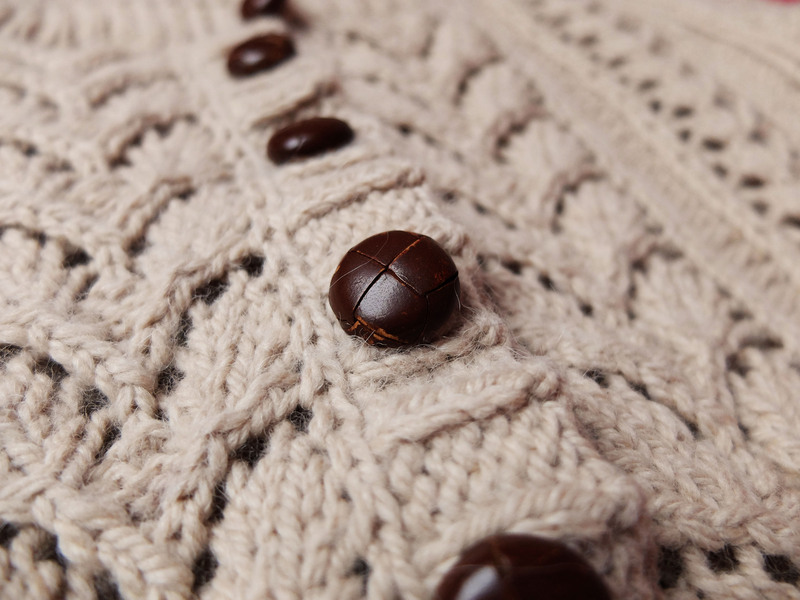 Speaking of buttons, they are one of the things I like most about this cardigan! For once I found what I wanted in my stash: they are a series of six buttons that my mother had rescued from an old jacket she threw away years (decades?) 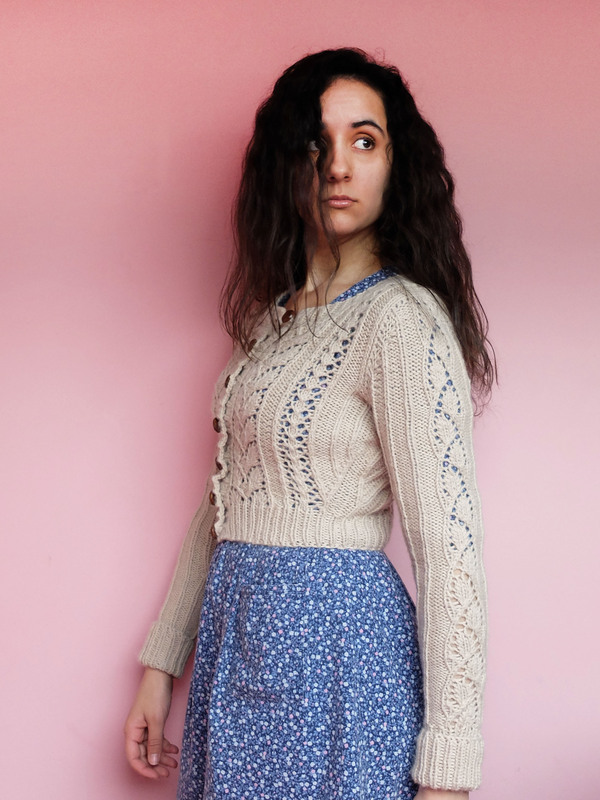 ago, and I love their vintage style; I think they pair extremely well with the natural colour of the yarn and the style of the cardigan. Another thing I love is the look of the side and sleeve decreases, so neat! And the lace panels, both on the body and on the sleeves. And the cuffs. And… Okay, I think it’s fair to say I quite like this cardigan! I sewed a Sencha blouse a little over two years ago, and although I loved the pattern and the look of the finished blouse, after some time I just couldn’t bear the synthetic quality of the fabric anymore. It was sweaty, unbreathable… made worse by the fact that I cycle everywhere, every day! 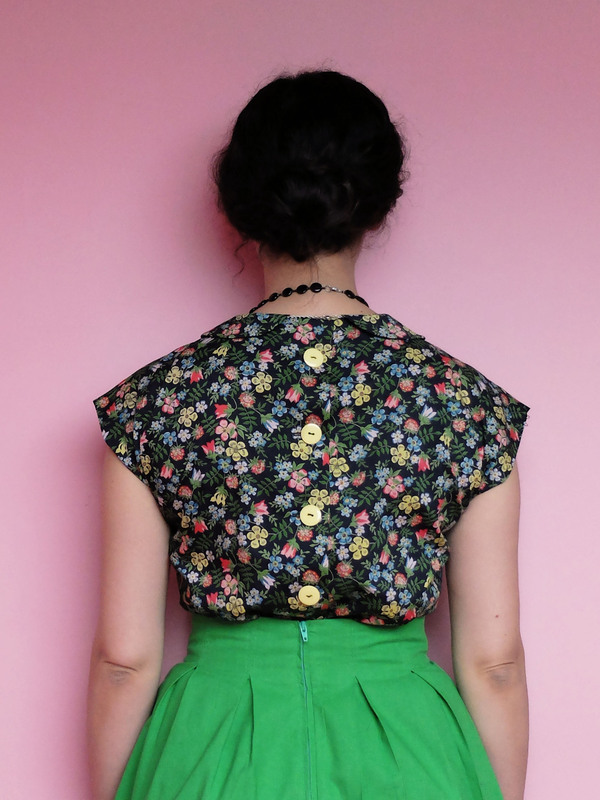 So I ended up donating the blouse and vowed to make another one in a nobler fabric someday. After finishing my Edenham Chelsea dress, I wanted to use up the whole length of Liberty instead of putting it back in my stash for God knows how long. 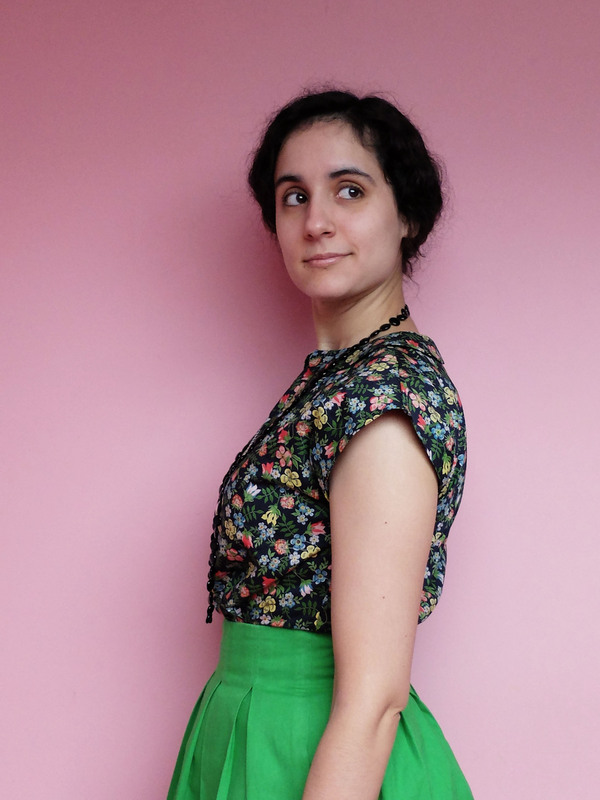 I hesitated between two of my favourite blouse patterns, Tilly’s Mimi and Colette’s Sencha, and the ridiculously small number of pattern pieces of the Sencha tipped the scales toward the latter. I remembered spending a lot of time on hand finishing for my first version of Sencha, because it was said to be impossible to use French seams due to the construction of the blouse, and I didn’t own a serger at the time. 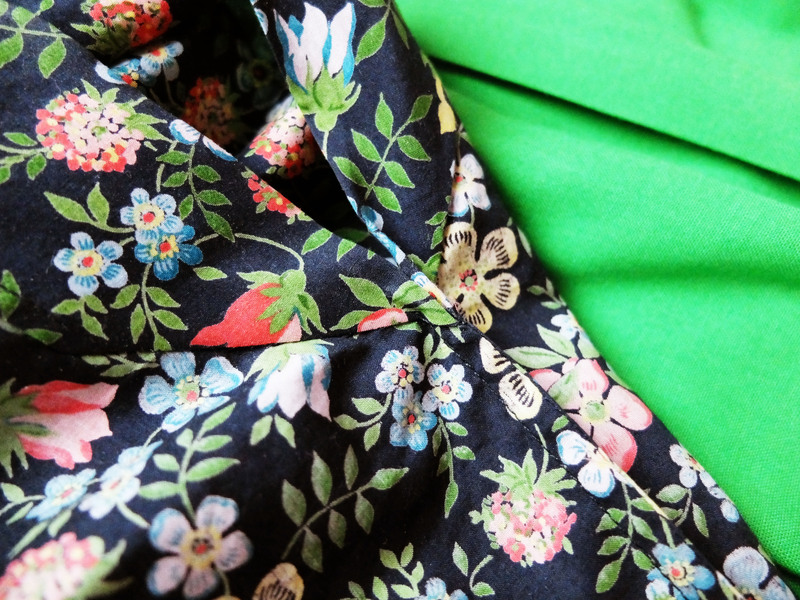 So this time I was about to gain a lot of time thanks to my serger, until I stumbled on this article that claimed it was entirely possible to French seam the whole Sencha blouse! I was both too lazy to change the serger thread to black and curious about testing this method, so I decided to try and use French seams instead of serging the blouse. And it worked, so many thanks to the author! 🙂 The only raw edge that was left was the bottom part of the sleeve hem, which I simply folded into a triangle and invisibly hand stitched like the rest of the sleeve hem. I didn’t follow the instructions of the pattern for the back opening: I didn’t sew it right sides together as per the instructions, but folded and pressed it wrong sides together (with the seam allowances of the top part folded inside), then hand stitched the top part closed at the same time as the rest of the button band. I think that’s what I did on my first version, too. I’m delighted with the finishing of this blouse! I used black interfacing so it wouldn’t risk showing through and finished the facings with some narrow green bias tape I had in my stash. The buttons I had to buy. I chose pale yellow ones that closely match the yellow flowers of the print and pop out against the black background. 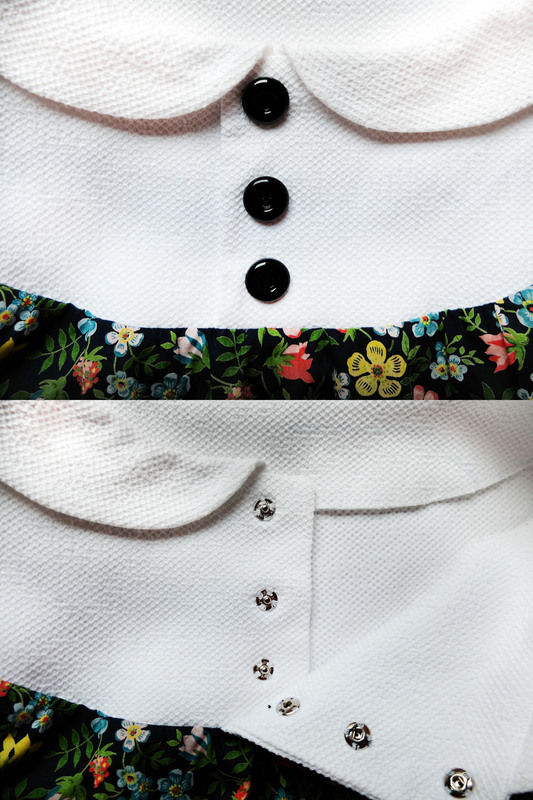 I almost forgot that it wasn’t included in the pattern, but the peter pan collar was drafted the first time I made the blouse, following Gertie’s tutorial (also in her book). I sewed the same size as the first time but I think the fit is better on this one, because I didn’t sew the side seams as high up as the first time. I stopped at the bottom of the sleeve hem instead of at the pattern marking. I didn’t feel constricted in my first version, but it does look better from the back! It’s rare that I don’t have anything to nitpick on something I’ve made, but this is one of those occurrences where I don’t have anything negative to say about the finished garment! 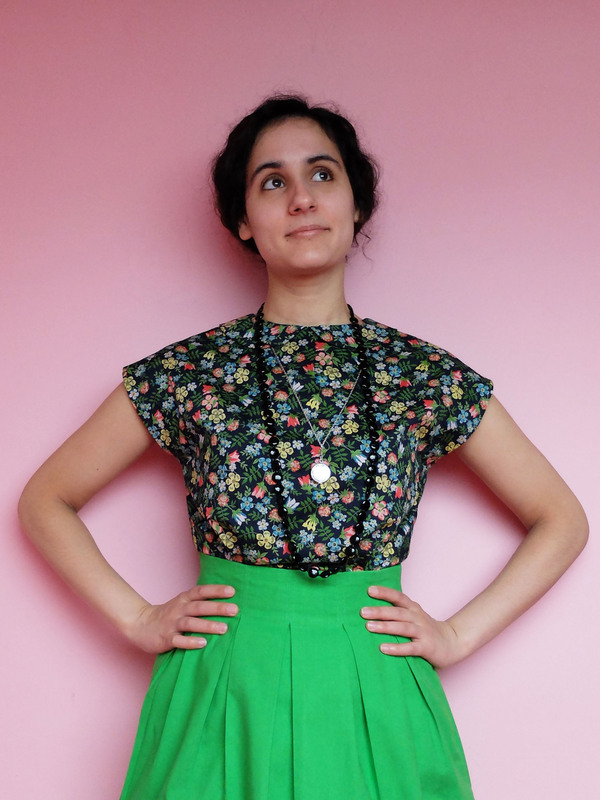 A fabric I love, a pattern I love with bonus peter pan collar — what’s not to like? I initially finished this dress on Christmas Eve, but since I had had to rush, I was not entirely happy with it. It was okay for a family Christmas supper, but I intended to wear it beyond that night, so I knew I had to change some details or I would not want to wear it for everyday life. So what was supposed to be my last project of 2015 became the first of 2016! The first thing that did not satisfy me were the buttons. I realised at the very end that I did not have any that were suitable. I have a lot of buttons that I’ve gathered from here and there, yet never seem to find what I need for a specific project and most of the time have to buy some new ones instead. The only series of minimum three black buttons in my stash were too small, and I also thought they didn’t go with the style of the dress. I used them anyway because they were all I had, but I knew there was a good chance they were just a temporary solution. I also sewed them through both layers of the button band for lack of time, and although it was possible to get the dress on, it was not very convenient either. And the last straw, I had sewed them unevenly! I bought prettier buttons (at Veritas – smaller versions of the ones I put on this cardigan) and attached snaps to the button band. I had chosen snaps for this dress and have found them to be very practical, so I am now a snap convert for this type of dress. While I was at it, I also rearranged part of the gathering. A small pleat had formed at centre front (you can sort of make it out in this picture) that made my eye twitch, so I unpicked and restitched a few centimetres. But the worst thing was, the dress was way too short! Once again, alright for Christmas supper, all wrong for everyday life… There was not even enough length folded in the hem, so I could not get away with just letting out a few centimetres. I had to resort to adding a piece of fabric as an afterthought, and hated the effect… until I had the idea of covering the joint with some lace from my stash that I hand sewed in place. 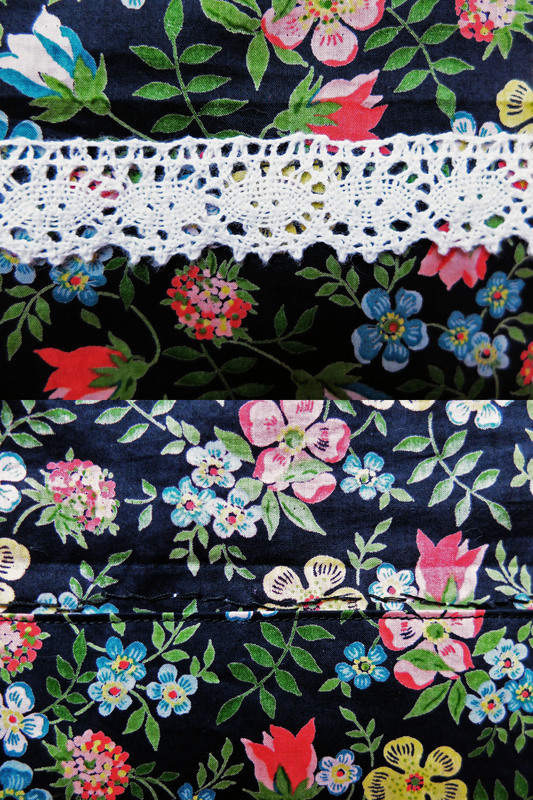 The piece I added to gain some length (about 7 cm – the original length was 1 cm above the lace!) is in fact the pattern piece of the contrast band of the other version of the pattern, which I folded in two lengthwise to cover the pinked seams of that section. The rest of the dress is serged, but I had changed the thread to white for the yoke and I was too lazy to change it again. But I think the result looks quite nice now! The lace does a great job of covering the seam and I simply love how it looks. A very happy accident. The main fabric is Edenham Liberty tana lawn. I cannot justify paying full price for Liberty, so I usually buy it either on sale or off eBay, where you can find quite a few good deals. 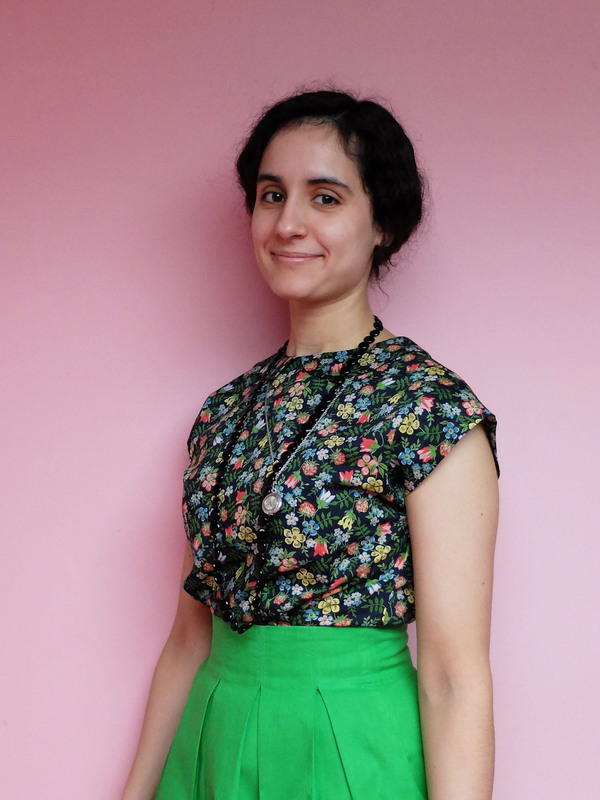 The contrast fabric is a remnant of honeycomb stretch cotton (the same I used for the collars, plural, of this dress). The stretch factor bothered me a little bit, but I liked how opaque it was for a white fabric so that’s what I chose in the end. And with such a light fabric as this Liberty, there’s actually no real risk of the yoke getting distorted, which was what I feared. While we’re on the subject of Liberty, can someone explain to me how come I seem to be the only one whose Liberty wrinkles? I always read about how wonderfully soft it is and how vibrant the colours are, both of which are true and the reasons why I buy it in the first place… and how it doesn’t even wrinkle and, well, mine does! 😀 Not awfully, but still, it’s a cotton after all! The pattern is the Chelsea dress by Christine Haynes. I sewed a size 4, the same as for my Emery, and didn’t bother with a muslin because I never bother with a muslin I knew this would be a forgiving fit. Except for the fact that I lengthened the dress and added snaps instead of buttonholes, I didn’t make any modifications. 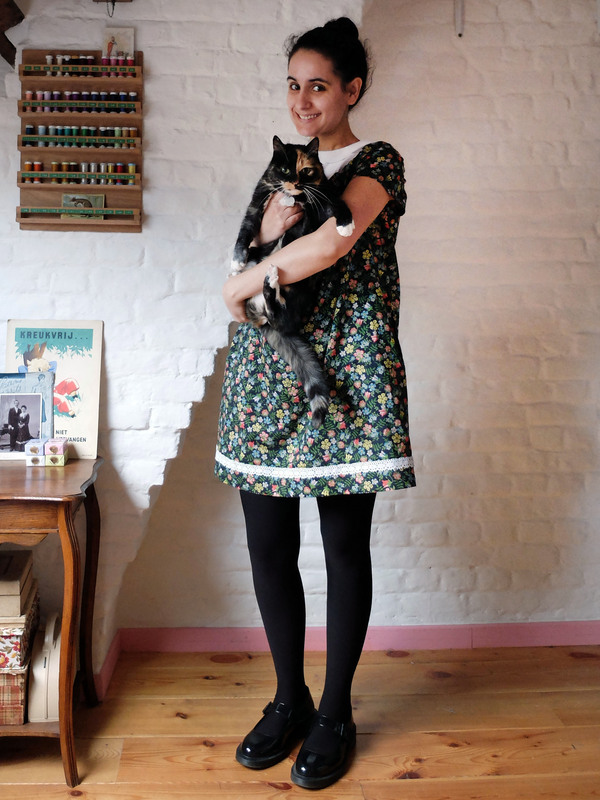 It was an easy dress to sew and it’s an easy dress to wear, now that I’ve lengthened it. 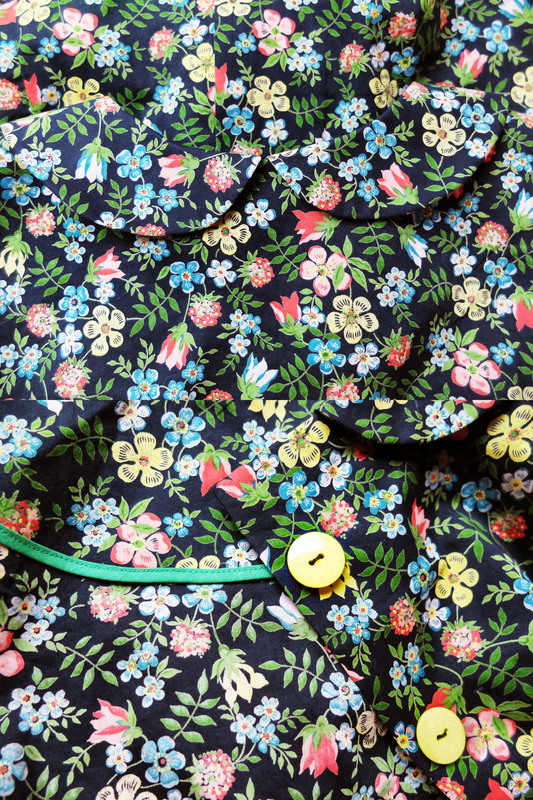 I just throw on my black Zinnia cardigan and I’m in a cute and comfortable outfit, with matching buttons!